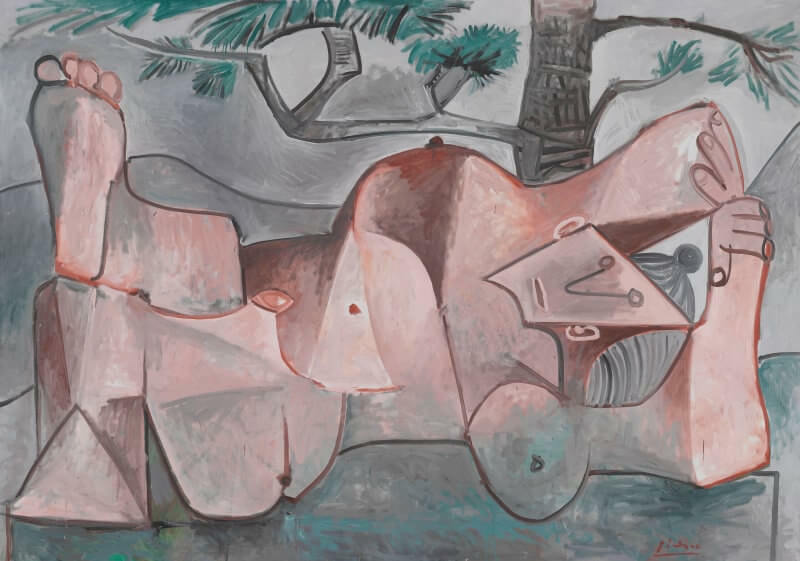 This painting, Woman under a Pine Tree is a "sculptured" form that fills the whole canvas as though Picasso was addicted by what he calls "the void between the frame and the picture." There are painters of space, for instance Cezanne and Matisse; Picasso is a painter of objects. Objects viewed from close up and perceived as volumes. In this young giantess, who reminds us less of Baudelaire than of Gulliver, the naked female body becomes a colossal geography. This close-up vision must seem monstrous to anyone who has remained true to the exclusive criteria of optical painting. But if one is willing to admit that here the sense of sight acts as a go-between for the sense of touch and to apprehend the form from within, so to say, taking as reference point the perception of one's own body, one is far less scandalized by this huge sculptured sign. The succession of volumes, conjuring up a structure in concrete cut up by the interplay of light and shade, is a plastic transposition of the passive heaviness of a siesta which the spectator himself is invited to share. This brings us to the end of a development that started with the Les Demoiselles d'Avignon and the African Period, when Cubism had not yet utilized the decomposition of the planes.